Like my leaning tower of cream wafers? For any given blog post I usually take between 70 - 120 photos. This one, I took 8. In a rush. We were on our way to a friends house for dinner with 2 other couples. I thought cookies would be a nice treat to bring along. And I won't lie, I've been looking for opportunities to test out some new (to me) holiday cookie recipes. In case you are wondering...it's not always wise to try out a new recipe when it's T minus 2 hours and you have to mix up dough, chill it, roll it out, cookie cutter (that's a new verb!) it, toss the cookies in sugar, place them on a baking sheet, poke four sets of holes in the top with a fork, bake for 7-9 minutes, cool, fill with frosting (which also has to be made separately...one kind wasn't enough for me or the time allotted...so I went with vanilla and raspberry) and then sandwich together. Are you tired yet? I am. During the 2 hour countdown I also had to shower, blow dry, brush my teeth, flat iron and swipe on some mascara among other make up products. Wow, I sound high maintenance. Now I'm extra tired. Anyway, clearly my time management skills could use a little....work. But somehow we, and the cookies, made it to our friends house with exactly zero minutes to spare. We enjoyed good company and tasty food. Have you ever had spaghetti with meat sauce Persian style? Or yogurt sauce with shallots? On your Persian spaghetti? Yum. And the cookies were a hit too. With a nice cup of Earl Grey tea. On a cool December evening. These cookies were a Christmas staple made annually by my mom when I was a kid. I remember these cookies being so delicate and delicious. She always filled them with red and green tinted frosting for a festive touch. Funny how you always want to go back to your childhood treats. At some point she relinquished her holiday cookie making to other family members and it has been years since we've had this Betty Crocker classic. This week seemed like a good time to revisit an old favorite. I wanted to give the red tinted frosting a little twist and I added 2 tablespoons of seedless raspberry preserves to the (full) frosting recipe. It's a nice addition and I actually prefer it to the standard vanilla filling. The wafers are tender and flaky and almost melt in your mouth. The dough is simple...consisting of flour, a little heavy cream and butter, dusted with sugar. The frosting is simple....butter, sugar and vanilla extract. The sweet filling makes up for the small amount of sugar in the wafer. 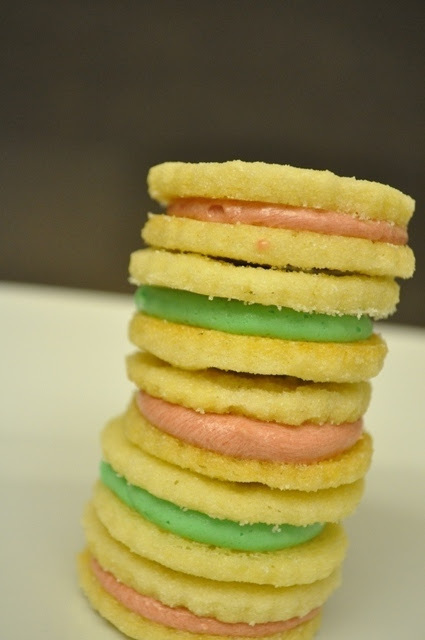 These fun cookies take a little patience (and timing skills) but make a special holiday treat! To get the recipe click here. This coming weekend is my official cookie making weekend. Check back next week to see Gingersnaps, Linzers sandwiched with raspberry preserves and lemon curd, Chocolate Chip Candy Cane Cookies, Chocolate and Red Velvet Cake Truffles and Meringues. I'm already feeling the sugar high! Awwwww - how cute and festive. Wish I was chomping down on a few of these right now. Oh! I remember when my mom and I used to bake these cookies together! They take quite a bit of time, so kudos to you for baking (and photographing) them in such a short span of time! They are delicious, aren't they?